Peace is everybody's business…….Keep the Caribbean and Latin America a Zone of Peace……End all wars…….Protect the environment. Trade unionists, indigenous peoples, farmers, popular movements, and delegations to the Summit of the Peoples in Lima gathered yesterday in the city’s Plaza de Marte, to denounce U.S. intervention in the region. Under the watchful eyes of a strong police presence, hundreds marched through the city’s central municipality of Jesús María. Demonstrators demanded the release of former Brazilian President Luiz Inácio Lula da Silva; an end to political persecution of progressive leaders in Latin America and the Caribbean; the removal of foreign military bases in Peru; and no more intervention in the domestic affairs of Venezuela, in particular. 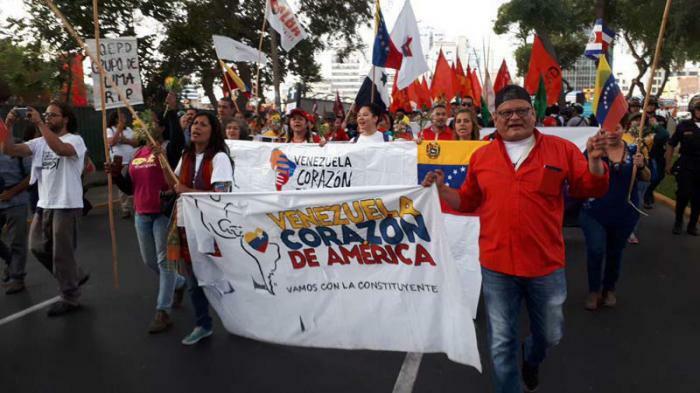 Gerónimo López, national secretary of the Peruvian General Federation of Workers, told the Cuban press that the march was held to denounce the United States’ hostile policies toward Latin America, despite U.S. President Donald Trump’s absence. In the meantime, presidents and heads of state continued to arrive for the Summit, to be inaugurated this afternoon. Jamaica Peace Council Create a free website or blog at WordPress.com.